NOMINATIONS are still being accepted for a school, college or educational project that has made the biggest impact across the city as part of the highly anticipated annual Aisling Awards. As the clock ticks down to the gala event on Thursday October 18, the chance to celebrate those who go the extra mile in our education sector is ongoing as nominations pour in for the category. Previous winners include Our Lady of Mercy Girls’ School, Methodist College, CBS and their Mentoring Programme and St Louise’s Comprehensive College. Speaking on behalf of the Kennedy Centre, who will be sponsoring the Outstanding Achievement in Education Award, Centre Manager John Jones said he and the West Belfast shopping complex were delighted to once again come onboard as sponsors of the Education Award. “We are extremely proud to once again sponsor this very important and worthwhile award,” he said. “Our education sector is certainly one that is thriving across the city in all fields and sectors whether it’s primary, post primary, further education or in training opportunities. 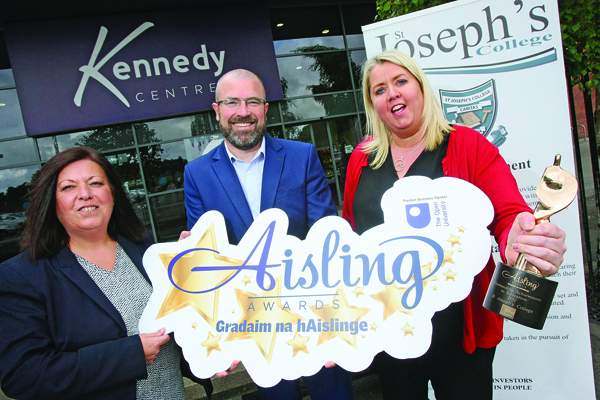 “The Aisling Awards are now in their 22nd year and the Kennedy Centre’s relationship with them is a long and supportive one. “We look forward to the countdown to the gala night in October which will be a real celebration for all,” he said. Also supporting the 2018 Aisling Awards are Premier Partner Open University, Ulster Bank, Ulster University, Sean Grahams, TG4, Foras na Gaeilge, Mercury Security, Movie House Cinemas, Mercury Security and Belfast International Airport. You can also fill in the nomination form on page 37 of this week’s paper. The 22nd annual Aisling Awards will take place in the Europa Hotel on Thursday October 18. For more information please contact Aisling Events on 02890 611916.